With these screen porch windows you only have to provide the openings. Porch windows make converting your porch, screened porch, deck, and even your garage into a three season room as easily as we've seen. 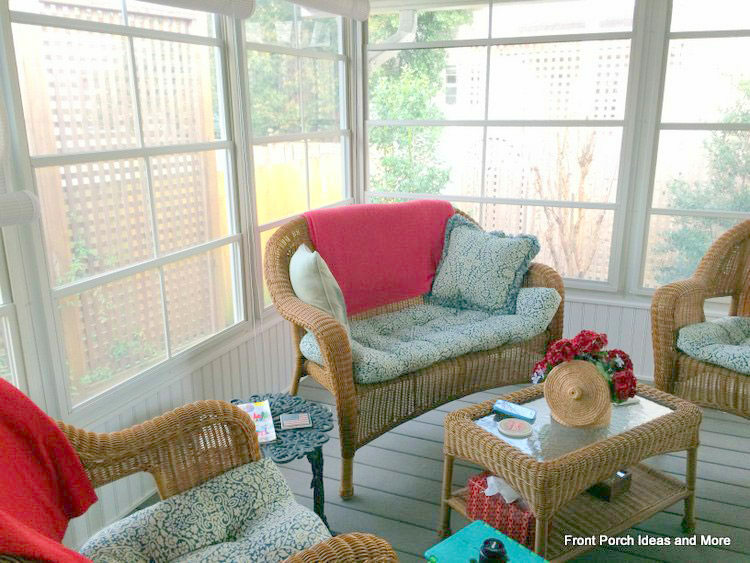 Convert your screened porch into a comfortable outdoor room at a fraction of the cost of glass panels. Designed to fit almost any size opening you can easily install screen porch windows yourself or hire a contractor. The windows featured here are from DIYEzeBreeze. We are proud to share this with you. 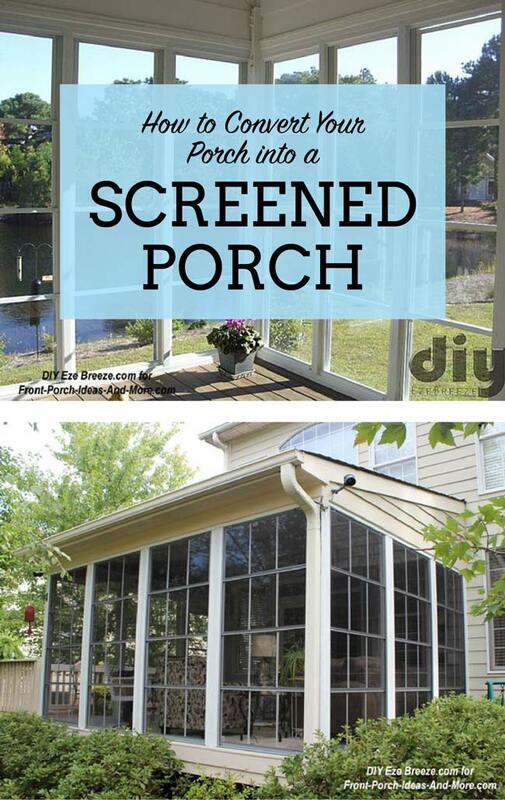 Want to enjoy your screened porch without so much dust and pollen? If you suffer by what we call "pollen pollution" from the likes of oak, pine, cedar, or other pollens, screen porch windows will reduce the pollen count so you can enjoy your porch more. And your porch furniture will love you for it. Mary and I know many people suffer with allergies or live in dust-prone areas and cannot enjoy their porch like they wished. But with these windows, your opportunities for porch time are greatly expanded. Mary and I are showcasing PGT's Eze-Breeze ® screen porch windows as an option to create your own three season porch. 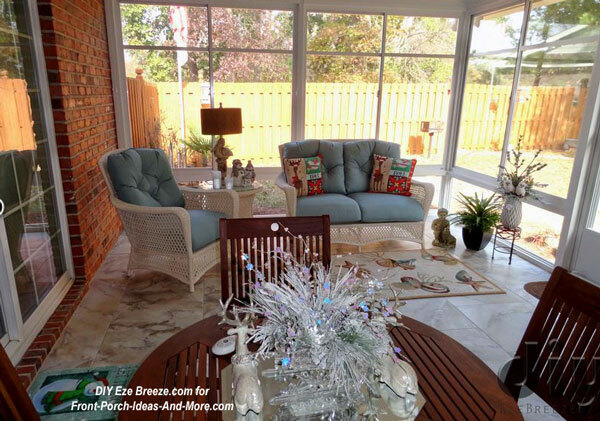 Our friend, Pat, invited us to visit her back porch and to show us her awesome screened porch windows. We really like how versatile and light they are. Pat says she eats her meals on her back porch every day. That's a wonderful testimonial to her back porch windows. And we also appreciated how substantial her screened door is - even with a deadbolt lock. 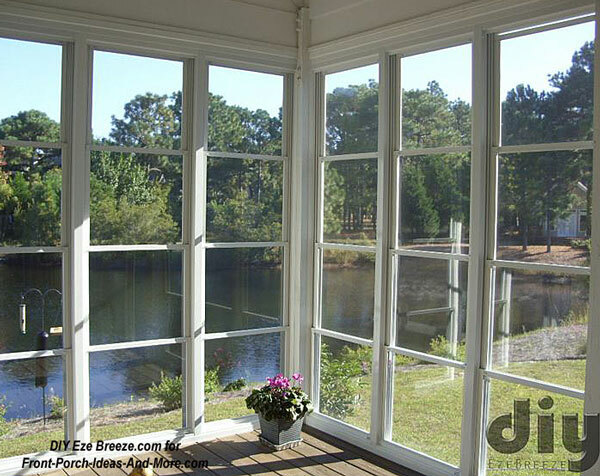 Eze-Breeze ® porch windows are very functional and appealing as well. 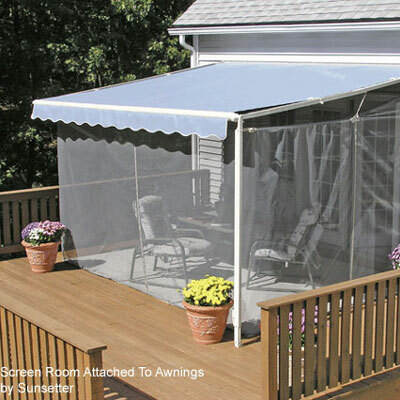 They are an investment that will add value to your home and bring extra comfort to your screened porch. Depending on your climate, of course, you could enjoy your screened porch all year round comfortably. It takes little effort to convert your three season room from screens to windows. Designed for efficiency, these windows stack and store right in place. Just like inside your home you can open the windows or have them down when it's cold outside (or pollen in the air). One of the differences between these windows and those inside your home is that you can open them up 3/4 of the way versus traditional double-hung windows that only open halfway. That means you can enjoy all those lovely breezes so much more on your porch. The less you have to do the more you you can enjoy your porch. Although not hurricane proof, they can withstand strong winds which is very commendable along with keeping out rain, snow, dust, and pollen. 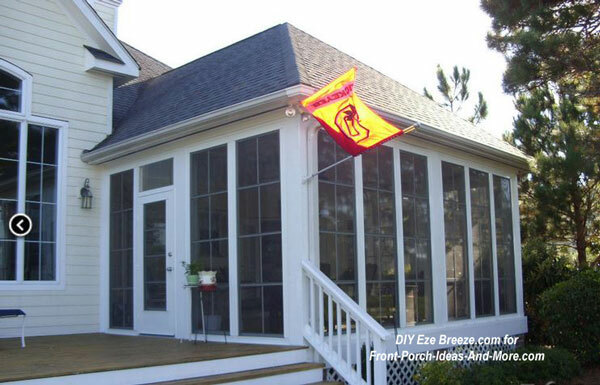 What Is an Eze-Breeze ® Porch Window? Mary and I like that they are a terrific alternative to glass windows. Made from the polyvinyl ("memory material"), Eze-Breeze ® windows can be distorted (like you see here) but then go back to their original shape. Ventilation: Eze-Breeze ® windows offer much more ventilation. A four panel porch window gives you up to 75% of ventilation space compared to only 50% for two pane glass windows. 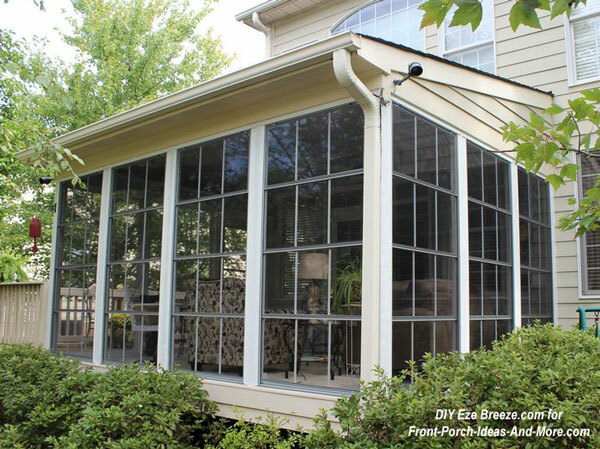 Size Can Matter: Porch screen windows can be ordered as large as 54 inches wide by 113 inches tall. Normally, glass windows should not be larger than 72 inches by 72 inches. Cost: According to DIYEzeBreeze, an Eze-Breeze ® room may cost approximately $2,500 while a comparable glass enclosure may cost up to $7,500 depending on the type of materials used. We recommend you compare costs for your specific geographical area. Shipping: Turn around time for screened windows may be as short as 12 days as compared to glass windows with an expected shipping time of 3-4 weeks. Wait time for installation by a contractor may take even longer. Installation: Glass windows may need to be installed by a contractor whereas screened porch windows make for an easy DIY project - see below. Here's another benefit of screen porch windows that Mary and I personally like. We once had a wonderful screened porch with glass panel inserts. We had to store the glass panels during the summer which meant we had to install and then remove the panels twice a year. Almost inevitably, I cracked several windows either during installation (or during removal) of the windows over the years and actually broke a few transporting them back and forth from their storage location. Replacing the glass was expensive. That won't happen with vinyl screen porch windows like these. They are extremely durable and rugged 10-mil vinyl glaze panels. 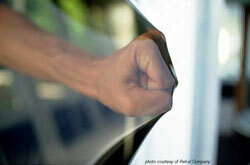 This flexible material is completely transparent, will not shatter like glass, and stores in place. 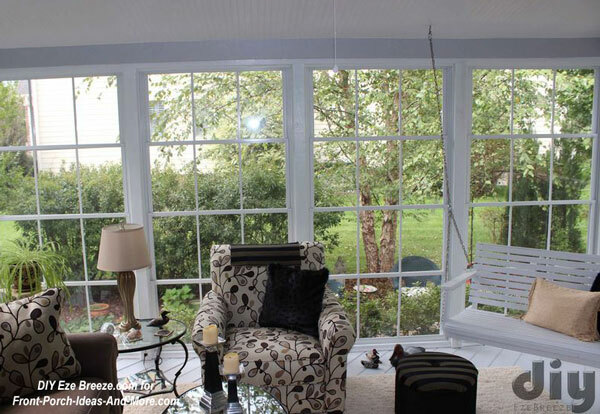 Not only are these screen porch windows as shown here less expensive than glass, but also very easy to install thereby saving you even more money. If you can measure accurately and can follow step-by-step instructions, you probably possess all the skills necessary to install these porch windows yourself. Or, if you prefer, a reputable contractor or handy-person can do it for you. Note: The information provided below is based on installing porch screen windows between your existing framing. If building a screen porch or porch addition on a deck, patio, or from the ground up, please see our "how to build a screened porch" section. This is perhaps the most critical step in the process of creating your new outdoor room. But have no fear, we found videos you can review to ensure your measurements are precise. Here's an example below and a link to other pertinent videos for your viewing pleasure. Important Note: No matter what porch windows you choose, measuring accurately will save you lots of headaches later. Most, if not all, manufacturers and distributors are not responsible for your measurements. Because they are custom made, once the production process has started, the order usually cannot be changed or canceled. As our friends at DIYEzeBreeze say: "Measure twice so you only have to order once!" Mary and I recommend you watch this short instructional video to see how easy it is to install Eze-Breeze ® porch windows. It is a great way to evaluate whether you can install them yourself or hire a contractor to assist. We list a few of the options you will have below to fit your ideal needs. Four individual panels slide up and down on individual tracks to maximize ventilation. These innovative windows are available up to 96 inches wide and offer spectacular views with minimal framework. The horizontal slider two-track system has two “vents” or panels that move along independent tracks. 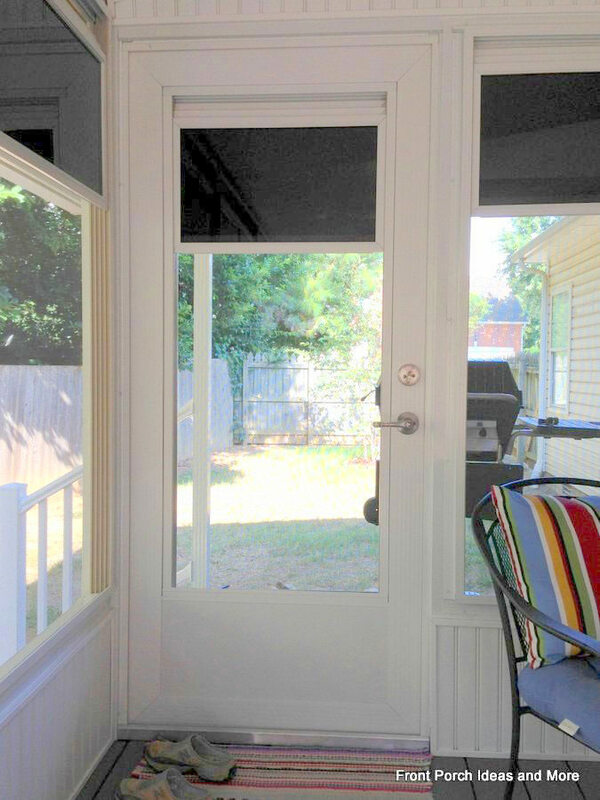 Porch screen window frames are powder coated aluminum, maintenance free and tilt in for easy cleaning! Periodically, wash them with a mild detergent to keep them looking nice. Mary and I like that Eze-Breeze"s ® products come in 4 frame colors: white, beige, pebble khaki, and bronze. The window panels are available in three different tints (clear, bronze, and gray) to minimize heat and glare. (Standard and BetterVue) You can order standard screening (1814 charcoal fiberglass mesh) or upgrade to BetterVue Screen which a tighter, thinner weave (2020 fiberglass mesh) than standard screens and offers more transparent views. It is ideal for keeping out "no see ums", gnats, or other very small insects. See for yourself how the amazing difference the right screening material makes by watching this short video. You also have the option of ordering windows without screens which may be prudent for transoms and/or odd-shaped window openings. Choose from two door styles or customize it for your specific needs. It comes pre-hung with a factory installed threshold. You can order an Eze-Breeze ® sample kit which is the perfect way to actually see and use the product. For a nominal fee you get to familiarize yourself with an Eze-Breeze ® window. 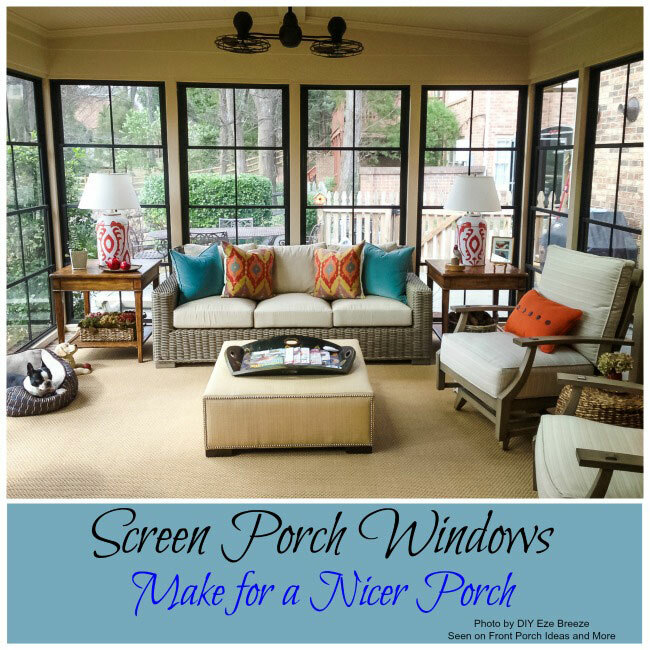 How About These Ideas for Screen Porch Windows? 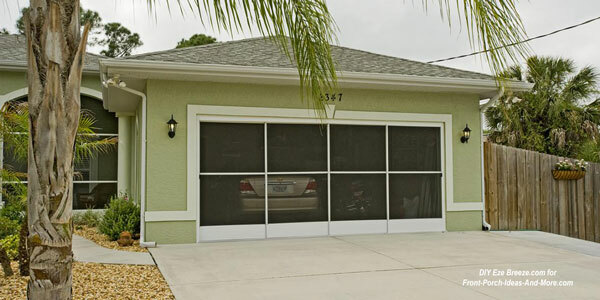 Use sliding panels for large openings like your garage so that you have an awesome screen room instantly. This short video shows you just how easy they are to install! I remember as a teen, my father and grandfather building large screen panels to fit across our garage door opening to create an enclosed screen porch. Mom and Dad enjoyed many hours relaxing in their new screened porch, playing cards and entertaining friends. Although Dad was ahead of his time he would have loved the versatility of screen porch windows like these. 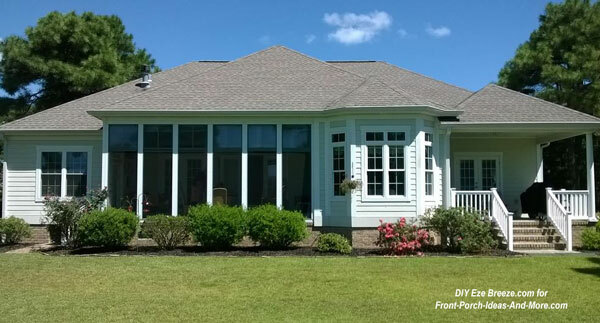 It doesn't get much easier than this to create your own screened porch enclosure or three season room than with the right screen porch windows. And remember, these windows present themselves as a more affordable option than glass windows, more durable, safer and greater functionality. Mary and I encourage you to contact DIYEzeBreeze through the link below for more information. .
Their phone number is 855-777-9987. Owners Paul and Mary pride themselves on their outstanding customer service "from first quote through installation" and have been associated with PGT Industries (the manufacturer) for over 20 years. Contact them today to learn more. We did a podcast with their Operations Manager. Please enjoy.